It’s already Fall, yet it still feels like we’re in the heart of summer with the hot and humid weather here in San Diego. Even though I enjoyed a day at the beach with my kids this past weekend, my mind is already into Fall and I’m ready for the cool weather to kick in. My husband finally took out all of our tomato plants and planted new Fall/Winter vegetables such as butter lettuce, broccoli, and Brussels sprouts. But due to the hot weather we’ve been experiencing, our Fall produce will definitely take some time to come in this year. That brings me to what we DO have growing in our yard, and the inspiration behind this recipe! Along with bell peppers, our fresh green jalapenos have been growing year around. Although we love fresh jalapenos on a variety of different dishes, most of the ones growing in our yard are spicy! So we can only go through so many, especially since my son can’t handle much spice. Last month, I ended up delivering bags of fresh green and red jalapenos to several neighbors since I didn’t want them to go to waste. Well this time, I was intent on using them up. My husband was quick to request a vegan version of Fresh Jalapeno Poppers since it used to be one of our favorites. I love all the components and flavors that go into making fresh jalapeno poppers but wanted to create something slightly different and turn it into an actual meal instead of a side. I roasted some fresh jalapenos, used some of my favorite brands of vegan cheese, and enhanced the flavor profile with some fresh herbs to bring you this vegan Jalapeno Popper Herb Grilled Cheese Sandwich! This sandwich is the best of both worlds! 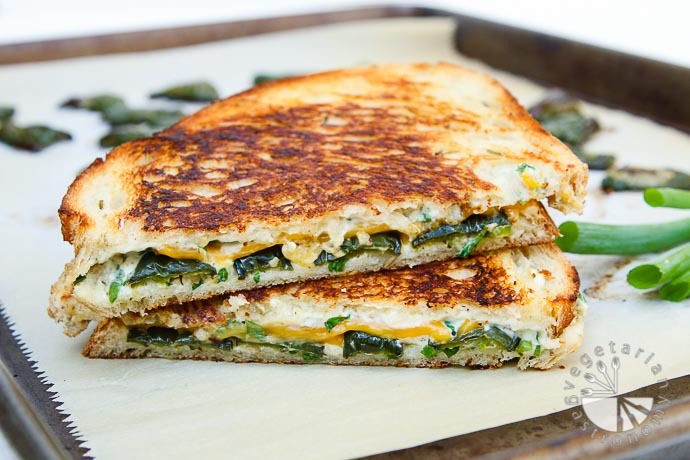 Contains spice from the fresh jalapenos, creaminess from the different types of vegan cheeses, has all sorts of textures, and the flavor of fresh herbs, sandwiched between two slices of sourdough bread, grilled and melted to perfection. It’s very easy to make, and you can even prep the components of the sandwich ahead of time and simply assemble and grill when you’re ready to serve. Now that is one awesome sandwich! Who doesn’t want to take a bite into it?!? 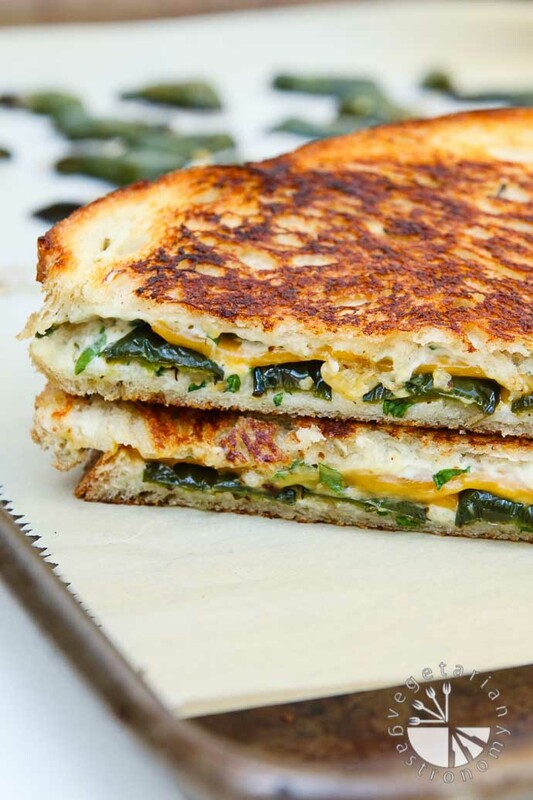 If you don’t mind the heat, you will LOVE this fresh jalapeno popper meets grilled cheese sandwich! It’s to die for! I’m hooked and addicted, and you will be too if you try it out! Be sure to tag me on Instagram or Facebook, or comment below the recipe and let me know what you think! 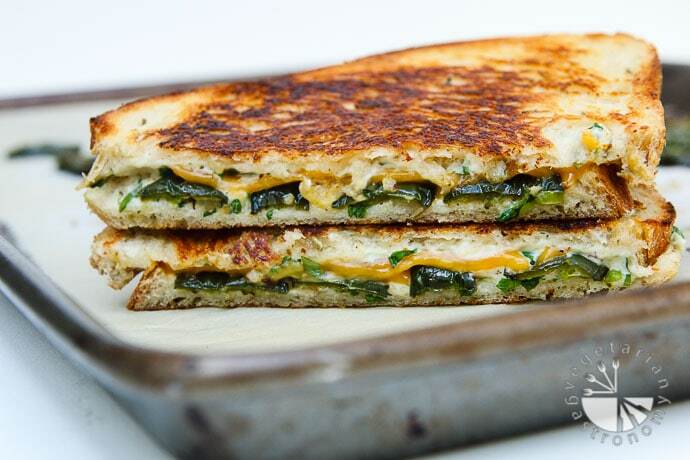 I’d love to see pictures of you devouring this Jalapeno Popper Grilled Cheese sandwich! The most indulgent comfort food there is! See how easy it is to veganize this popular favorite! Slice the fresh green jalapenos lengthwise, de-stem, remove the inside white parts, and scrape off the seeds as best as you can. Toss the jalapeno halves with a little olive oil to coat, a little salt, and freshly ground black pepper. Line a baking sheet with parchment paper . 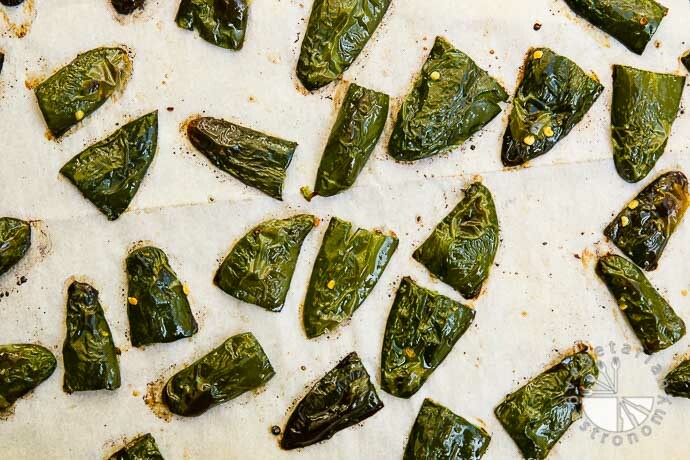 Place the jalapeno halves cut side face down in a single layer on the parchment paper. Bake in the oven for 10-15 minutes, or until the jalapenos start to blister and blacken slightly. When they are done, remove them from the oven and let them cool completely. While the jalapenos are baking in the oven, prepare the Herb Cream Cheese by combining all the ingredients listed above in a small mixing bowl and set aside or store in the fridge until ready to use. To prepare the sandwich, spread a generous layer of the Herb Cream Cheese on two slices of sourdough bread. Cut the slice of vegan Follow Your Heart American Cheese Slice in half. Working on one slice of sourdough bread, place/align half the slice of American Cheese on the right half of the bread. Next place a layer of the roasted fresh green jalapeno halves (~4-6 halves depending on size of jalapenos and bread). Next place the other half of of the slice of American Cheese on the left half of the bread on top of the jalapeno slices. Close the sandwich by topping with the other slice of bread with the herb cream cheese spread on it. Note that the reason for slicing the cheese in half and it's placement is to help the sandwich stay together after grilling and melting the cheese. Heat a pan on medium heat. Lightly butter one entire side of the sandwich. Once the pan is hot, place the sandwich, butter side down. Grill until bread is golden brown. Press down on the sandwich lightly, then butter the top side of the bread, flip the sandwich over and cook until second side is golden brown and the cheese is completely melted. Repeat with the remaining slices of bread to make a total of 4 sandwiches. Slice the grilled cheese in half, and enjoy with your favorite hot sauce or as is! Pre-Ahead Tip - Roast the fresh green jalapenos and make the herb cream cheese ahead of time and store in the fridge until ready to assemble the sandwich. Vegan Cheese - I highly recommend using Follow Your Heart American slices (not the block) for the vegan cheese layer. If you have another favorite cheese slice, feel free to use any alternate brand/cheese. American, Cheddar, or Jack cheese would all work with this sandwich. The pictures don't do it justice!! One bite and you'll be caught! It's really that amazing. This sandwich is totally for you!! Seriously I think you guys will love it...let me know if you try it! And thank you!! this was amazing! love your blog, anjali! Thank you!! This sandwich has comfort, gooey, cheesiness, with added spice written ALL over it! It's the perfect sandwich to satisfy my craving in between all the veggies. AND it's vegan. Thank you so much for following! Anjali! This is an epic grilled cheese! Never in a million years would I have thought to add jalapeno halves. I used to love jalapeno poppers in my pre-vegan days - I'm pretty sure this would be a great replacement! Looks amazing! Thanks Mandy!! It's seriously awesome! Jalapeno poppers were our favorite...we'd make large batches a few times a year, and it was always a staple item at our annual holiday parties, but since going vegan this past January, I haven't made them. When we had a ton of fresh jalapenos growing in our yard, I needed to do something with them. I was craving sandwiches, and my husband wanted me to try making vegan jalapeno poppers, so this was the best of both worlds, and so easy! There are some great vegan cheese options out there for when you have that occasional craving, and they worked wonders in this sandwich =) Let me know if you try it! I just made this and I just want to thank you for the heaven my taste buds just went through. 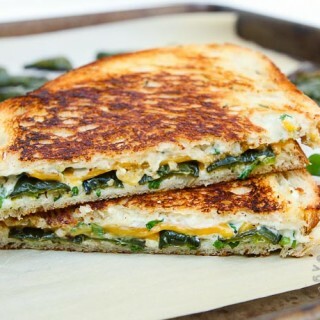 This is hands down my favorite grilled cheese! It's full of flavor with just the right amount of kick, and the herb cream cheese is delectable, and I would even use it on cucumber sandwiches or just on crackers. I'm definitely going to make more of your recipes! Thank you SO much Tiffy! You're comment and share made my day! I'm so excited you tried and loved this recipe since it's one of my favs! I've always loved jalapeno poppers before i went vegan, and instead of developing my own vegan version, for now I created this creamy flavor-packed sandwich using some of my favorite vegan cheese brands out there! And yes...the herb cream cheese is delicious! Thank you for trying out my recipes and commenting. If you need any recs let me know! Happy cooking! Oh then you'll definitely LOVE this sandwich!! It's awesome...nice kick to it with the roasted jalapenos and that creaminess from the cheese...such a great flavor combination! I've served this sandwich to several non-vegans and they LOVE it! Let me know if you give it a try! Thank you! Such a yummy grilled cheese...with a secret KICK! Thanks Rebecca! I especially love it when the jalapenos are super spicy! That combined with the creamy makes for an amazing flavor! Vegan comfort food at its best! I can't wait to try this with the jalapeños in our garden! It so is! Thanks Jenn! Yes, you need to try it. Super easy and one of my favorite sandwiches! Thanks Linda! They were inspired by all the jalapenos in my yard and a craving for jalapeno poppers + a recent switch to veganism =) This was perfect! Yep...that's exactly how these were developed...tons of jalapenos in our yard and I also went vegan and was itching to create a vegan jalapeno popper since it's one of my favorites, but did a sandwich version instead! So good! I love anything hot and spicy! What great sandwich! and creamy!!! So good! Thank you! I just can't get enough of 'Jalapeno Popper' and these sandwiches look amazing!! I can almost taste that hint of spice and ooey-gooey melting cheese center...Yummmm!!! My exact thoughts...can never get enough of them! This sandwich has been amazing! We make it all the time, even served it to 35 non-vegans for our holiday party and it was a huge hit! I seriously wanna jump up and make this right now! Thanks Uma! Let me know if you do! This sounds sinfully delicious. A definite crowd pleaser! Thanks Kelly! Crowd pleaser for sure...served it to 35 non-vegans during our holiday party last year and it was a huge hit! 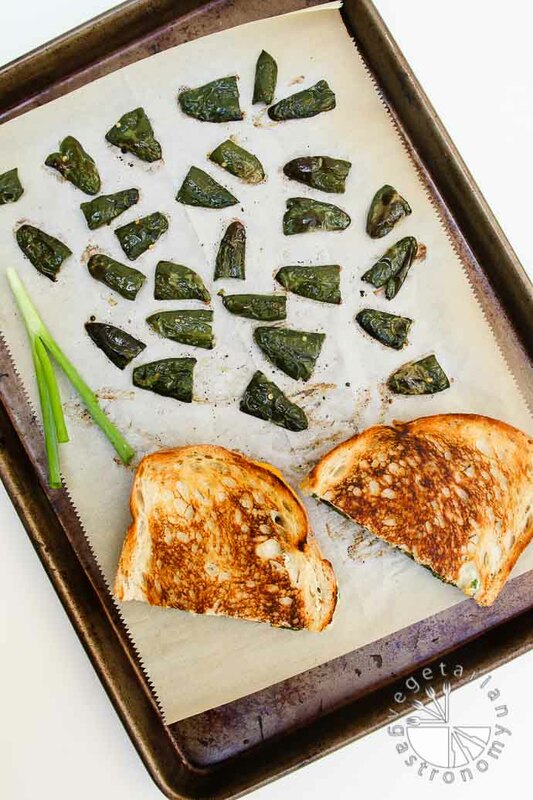 i havent had jalapeno poppers in a while but using them as grilled cheese is super creative. i can smell the roasted jalapeno already. It's amazing Dixya! Especially when they are roasted...takes the edge off of them and combined with the creaminess of the grilled cheese it's delicious! I definitely need to try these! I was just thinking tonight about having a grilled cheese on sourdough. Sadly, I don't have any jalapeños, but Trader Joe's is only 1½ miles up the road, and I DO need a bit more exercise today, so...(Plus they have a pretty decent vegan cream cheese, so there's that as well! )Might save it for tomorrow night's dinner. Rain and gloom's supposed to come back around then, so pair this with a nice smoky tomato soup? Might be just the thing - AND I can stop at TJ's on the way home from work so it's not like it'd be out of my way! PERFECT! Yes!! You'll love these and they are so easy to put together! I've always loved jalapeno poppers so what better way than in sandwich form! Pick some up and make them! Let me know if you do.